The way we consume media has changed dramatically since the advent of digital. Digital has eroded the market share of the traditional publications like magazines, newspapers and TV. Social Media has gone a step further, and given average Joe’s the opportunity to be the star of their own reality shows. 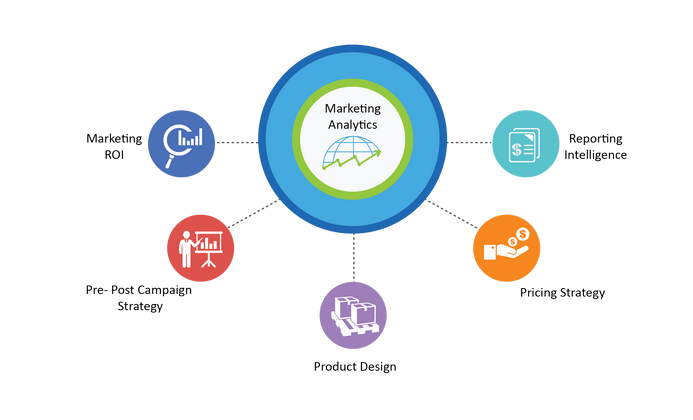 How has digital marketing impacted marketing managers? As a marketing manager without digital know-how, you’re dead in the water. Finding a job as a traditonal marketer without any digital skills isn’t going to happen. A career in marketing and management has become grossly dependent on your digital experience and the ability to understand digital customers, digital channels and digital platforms. You also need to be able to effectively manage your digital agencies. How has the digital age impacted Entrepreneurs? Digital Marketing is the most cost-effective way to grow your business and has made it possible to have your shop open 24/7 through Social Media, Email, SEO, websites and online advertising. What is even better, overheads can be drastically cut since you are able to run your business from anywhere in the world and even from the comfort of your own home. An effective digital marketing strategy will help you discover who your customers (target markets)are and then how to decide which channels you will use to reach them on. 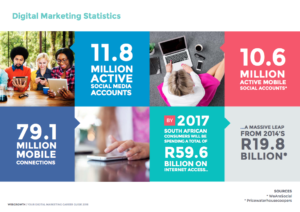 Your target market also helps define your goals and create a complete digital marketing content plan that you can roll out for the entire year. Having a clear Digital Marketing strategy is key in achieving your marketing and sales goals . Many marketing managers and entrepreneurs claim they don’t have the time to draw up a strategy, but unfortunately without this, growth and profit will simply take a lot longer to achieve. Without a digital marketing strategy, you will also become overwhelmed by the sheer amount of work you have to do daily and you will be completely in the dark of whether you’re achieving your goalsworking effectively, or whether your marketing budget is working for you. Set your business goals – do you want to create awareness, build a brand, increase engagement or get more sales? Create a marketing funnel – how are you going to generate awareness, interest, desire and action? How are you going to harvest leads? Leads are customer enquiriesand are pure gold as they usually come with an email address that can be used to target consumers later on. How are you going to drive traffic to your website? How can we have it rank on page 1 of Google without paying? What do we need the website to look like to achieve our goals? What’s the role of Social Media in your strategy and which channel does the best? Social Media Marketing is all about communication and enables your customers to speak to you directly and easily with quick and responsive two-way communication. This is called engagement. Your ultimate goal is for customers and prospective customers to share your content. Once they start repping for you, your job is done. Social Media is one of the fastest growing marketing mediums and is essential for any business that wants to remain relevant in today’s modern world. Social Media Marketing is also a very inexpensive way of reaching your customers and the modern consumer spends approximately 60% of their mobile usage on social media. Digital Marketers need to understand how to develop a strong social media presence to increase brand presence and ultimately sales. Create your content plan – what are you going to talk about, how often are you going to post, how often are you going to share other people’s content vs creating your own unique content. 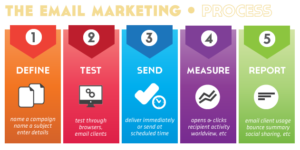 Email Marketing is simple and yet it is possibly the most powerful tool in your digital arsenal. It is an amazing marketing tool right up until you consider the spam that will clutter your potential customers’ inboxes. Your goal is to produce emails that are not spammy and that your customers love, read, share with others and ultimately buy your product or service. Email Marketing is the one of the few marketing tools that can bring prospective customers back to your website by directly communicating your message or proposition to their inbox. It is essential that today’s marketers understand the best ways to develop email lists, use email nurturing to create more business opportunities and turn prospects into paying customers. Create an account with MailChimp or a similar platform. Load your customer database into the Lists. Design your mailer using their simple drag-and-drop platform. Make sure you use a compelling subject line,if you want your mailer to be opened, and please don’t call it Newsletter! Send a test mailer to check for errors. Once it’s been sent out, give it a few days and then check your report to see how you can improve the next one. Your website is the basic starting point of all your digital marketing. It is the representation of your business online and if it is badly designed, you’re not going to thrive out of the starting blocks. It is important to remember that your website is the first place people go to to check you out. If your website doesn’t turn up on page one of Google, you won’t be found by people looking for your services (SEO). 93% of online experiences begin with a search engine. 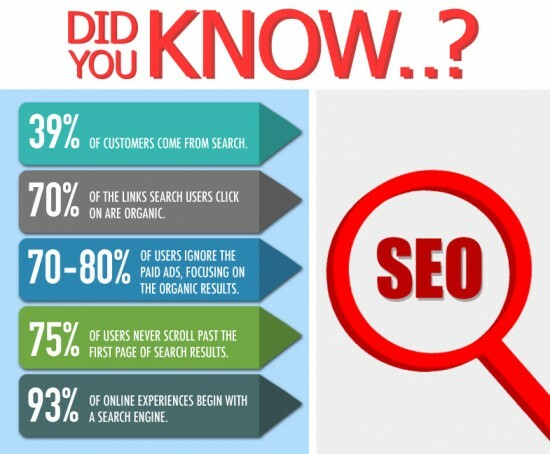 Due to evolving practices and search engine algorithm updates, 70% of links users search for are organic (not paid for), so if you can master SEO, you have great potential to drive more traffic and conversions (sales) to your website. Design a website that is focused on your customer’s needs, your goals and that is easy to use. Optimise your content, website and blog for Google. Paying to rank on page one of Google using Google’s Adwords. Free platforms (like Google and Facebook) are only free because advertisers pay these platforms to place adverts in front of your face, hoping you’ll click. The advertiser only pays when you click, this is called PPC or Pay-Per-Click. As more and more businesses move to online, it becomes harder to reach customers which is why paying to reach potential customers is the only way to go. Mark Zuckerberg (CEO of Facebook) and Google are holding back potential clients, due to alogrythms, until you pay for advertising and then they’ll release to you a stream of prospects that will generates sales and keep your sales team satisfied. So just pay them, we say! Identify which channels you’ll use. Identify the words people are typing into Google to search for your services. Create landing pages and banners. Implement, monitor daily and make changes daily.